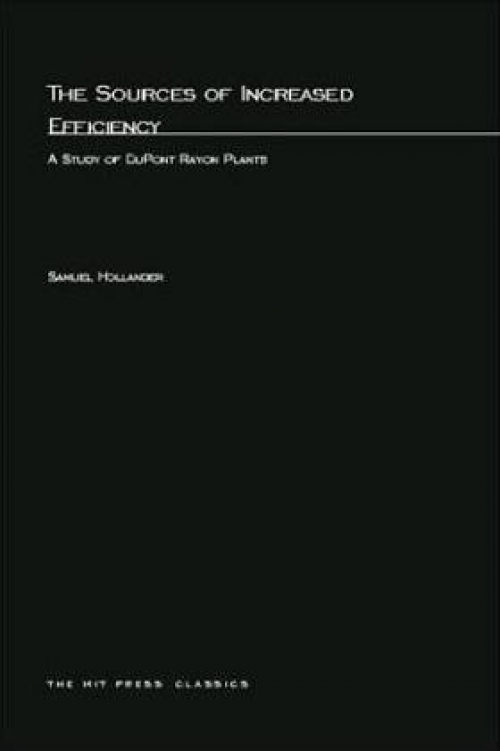 An extraordinary opportunity offered by the Du Pont Company gave Professor Hollander free access both to all detailed cost and much investment data related to rayon manufacture at a number of plants, covering a period of thirty years and to a wide range of informed personnel and officers. These data enabled Professor Hollander to make an unprecedented study of a large industrial firm for the purpose of measuring the contribution of various sources of improvement to increased efficiency. From the mass of information available, he has selected sound technical details and concepts, excluded all irrelevant material, and presented a carefully organized case study showing how technical change accounts for a very high proportion of the increases in productivity. Specifically, this information includes descriptions of the contributions of various types of technical change to production cost reductions, quantitative estimates of the contributions of technical change and economies of scale to increased efficiency, and analyses of the relation between technical change and investment and of the sources of new technology. The microeconomic approach is related to certain macro studies of productivity increase, and several policy implications are drawn. This study should be of great interest to a wide audience including economists, economic historians, and technologists. All those concerned with the problems of economic growth, industrial structure, patent protection, technical invention, research and development, and the general progress of civilian industrial technology will find this book a valuable addition to their libraries.